Ghosts are always a problem for Martin Scorsese. Each film he makes is inevitably compared to his own past masterpieces, so let’s start by saying that The Departed (those ghosts are even in the title now) is not as good as Taxi Driver, Raging Bull or Goodfellas. In those, Scorsese led the way, forging his own style and morality. Now, at 64, he’s doing remakes, here taking on the fabulously twisted and flashy Hong Kong triad thriller, Infernal Affairs. But there’s an odd feeling that something isn’t quite right throughout The Departed, like when a favourite T-shirt comes out of the wash and you’re not sure if it has shrunk a bit or you’ve put on weight. It’s still a pretty good T-shirt though. This is a gangland tale, set in Irish-American Boston (a move that feels forced, as if Marty thought that as long as he doesn’t do Italians, people won’t notice we’ve been here before) where Jack Nicholson’s Frank Costello rules the underworld like an overweight devil. He’s planted a mole (Matt Damon) high up in the police force. 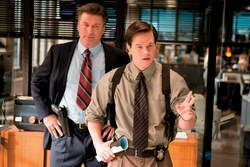 But the cops - led by an overweight Martin Sheen and an over acting Mark Wahlberg - have placed a rat (Leonardo DiCaprio) high up in Costello’s mob. The device worked in Hong Kong, a sort of ying/yang structure that suited the oriental setting. Scorsese’s efforts to mould the situation into a more Catholic struggle between good and evil aren’t quite as successful, although the director’s familiar themes of what man will do to survive are reassuringly in place. Indeed, while Damon and DiCaprio have never been better - at last Leonardo finds a role that suits his youthful energy! Nicholson, in his first collaboration with Scorsese, is at his worst, desperately trying to steal every scene with Lucifer-like tricks. I found myself wishing it was De Niro or Day Lewis in the part. Those ghosts again. And yet The Departed slithers along like a rat, hooking us right to the very last shot, and there are several superb set pieces along the way. It’s in these moments when Michael Ballhaus’ camera glides over unspeakably violent acts to a rocking soundtrack, that you know you’re in ScorseseWorld and that there’s still nowhere on planet cinema quite like it. General release from Fri 6 Oct. This remake of the Hong Kong triad thriller 'Infernal Affairs' is not as good as the Scorsese classics but still hooks right to the very last shot with a distinguished cast - DiCaprio finally finding a role that suits and several superb set pieces along the way.